Stop Calling Them Sanctuary Cities- Aiding and Abetting Criminals is NOT Holy! Stop Calling Them Sanctuary Cities- Aiding and Abetting Criminals is NOT Holy! Of course, there is the recent silly transition from Illegal Alien to undocumented Alien. If they are simply undocumented for coming in to the country illegally, then a murderer is simply an undocumented executioner, a kidnapper an undocumented parent, someone who drive despite the fact their license was suspended an undocumented driver, a burglar an undocumented resident etc., etc. Another one of those new-fangled, softened-terms is sanctuary cities. That particular term didn’t replace another one like “undocumented alien.” It’s a relatively new term because municipalities used to act to keep criminals under lock and key, they would never consciously break the law. But cities such as Los Angeles, Chicago, NY, Seattle and others that call themselves “sanctuary cities” aren’t providing sanctuary, they are aiding and abetting criminals. In most cases violent criminals. 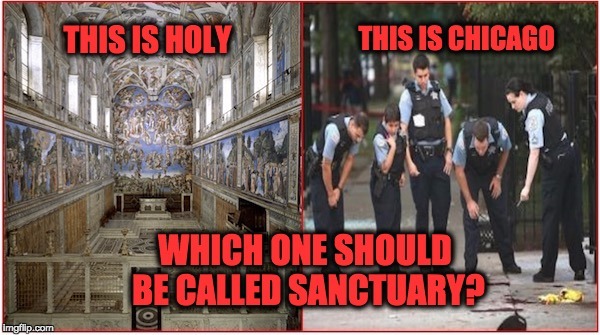 The original meaning of sanctuary is a sacred and/or holy place like in a church, synagogue, or some sort of shrine like the Vietnam Memorial in D.C. In medieval times, people would go to Churches (sanctuaries) to avoid unfair arrests. That’s how the term grew to include any “safe zone,” but in its purest form sanctuary refers to a sacred area. Chicago calls itself a sanctuary city, but releasing violent criminals into the general populations is not a holy act. Earlier this week, the Immigration and Customs Enforcement Agency(ICE) published a report, titled “Declined Detainer Outcome,” ICE issues detainers to federal, state and local law enforcement agencies to notify them that it intends to assume custody of a an illegal alien already before the local authority releases them into the public. The detainer simply requests the law enforcement agency notify ICE, ideally within at least 48 hours before an illegal is released so ICE can pick them up when local law enforcement is done with them. Remember Kathryn Steinle was killed by someone who was deported five times and despite an ICE detainer was released by the San Francisco sheriff’s department because they are a sanctuary city. According to the report (embedded below) in just one week 9/28/17-2/3/17 a total of 206 Ice detainers were rejected, while there were a some being held for crimes liberals would consider mild (drunk driving-which does kill others), the vast majority of cases were homicides, assaults, domestic violence, sexual assaults, weapons charges, and the like. Now I ask you, is protecting people who committed homicides, assaults, domestic violence, sexual assaults, weapons charges, etc., a sacred act? Or is it simply aiding and abetting a criminal to escape into the general population where they may commit another crime.